The other day I was printing with a Wiiboox C300 whose electronics is very similar to Makerbot Replicator 1 (a modified Mightyboard, Rev. E I think). Not long after the printing started, I suddenly found the machine went quiet, with a blank but lit screen. After powering it off immediately I smelt a very recognizable scent, which indicates one or more IC is burned. Several minutes later I powered on again, it was unable to acquire temperature reading from both extruders and Z stepper seems to be dead. Having thought that it was insufficient cooling (I unplugged the system fan to make the machine quieter), I didn't realize the actual cause of the accident until I burned the replacement board. When I plugged the thermocouple and powered on, smoke came out from the two thermocouple ICs (MAX6675). 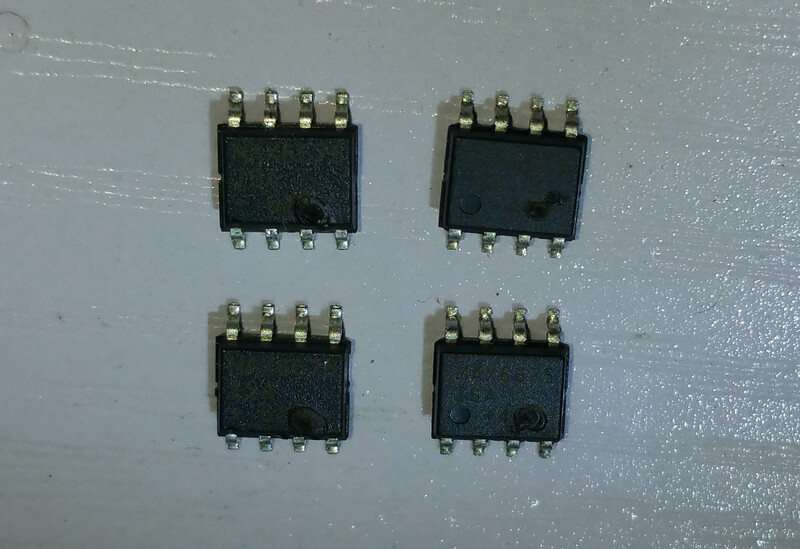 I looked at the original board and found 2 MAX6675s on it were also burned and all burn marks on 4 MAX6675s have the same positions, as shown in the title image. Later I checked the connectivity between thermocouple terminals and other parts of the board and found the 4 terminals all came into contact with the heater of the extruder A (right extruder), which was not supposed to happen. This accidental connection surely burned the board. 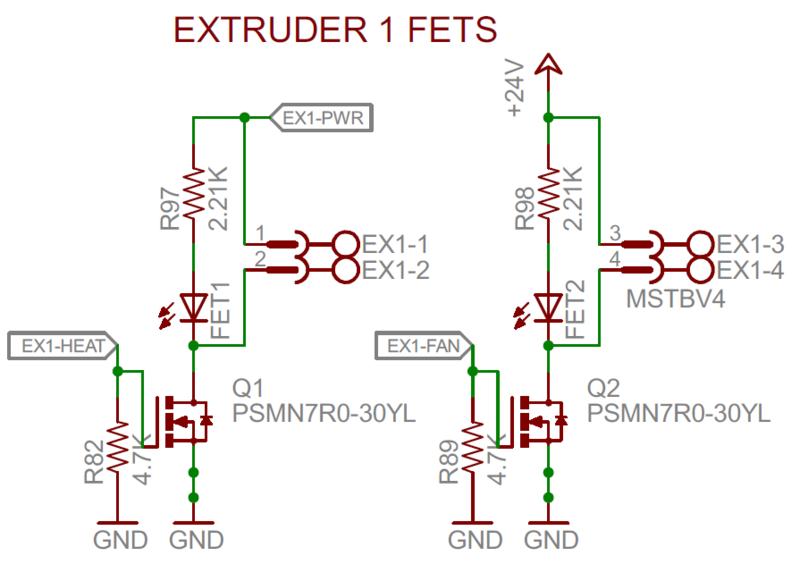 Heaters and fans have MOSFETs on their low side to drive them, as shown in the schematic. That is, one of their two terminals is always connected to the +24V power rail, regardless of working state. So I supplied +24V to a 5V chip, BOOOOOOOOM. Even I replaced broken MCUs and MAX6675s, both boards were still behaving weirdly. So a third board is on its way now. What made the short circuit happen? The resistance between the heater and all metal parts on the extruder is zero, so the unintended contact happens between the heater resistor and the heatsink. 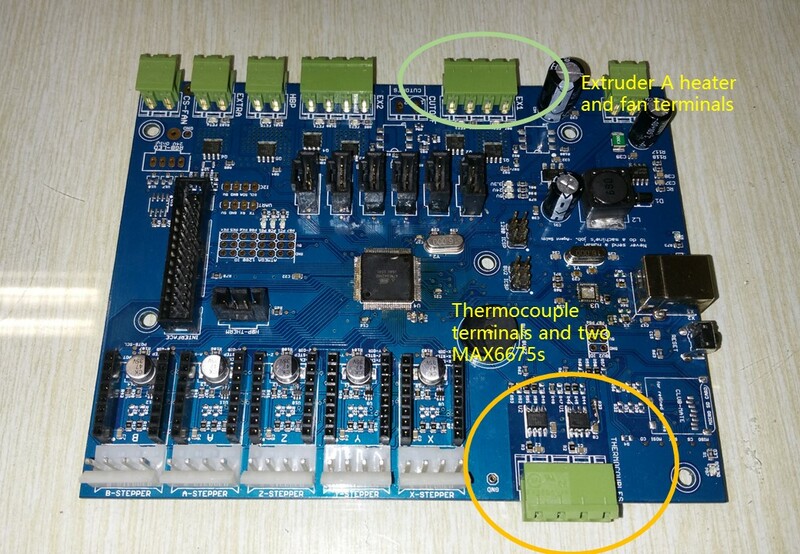 As the thermocouple, which is also a good conductor, always contact with the heat sink, a current path between +24V and thermocouple ICs is formed. As the accidental contact between heater and heat sink has a considerable probability, low-side MOSFETs can be considered a design flaw that should be prevented in future designs.